The difficult we do every day. The impossible just takes longer! 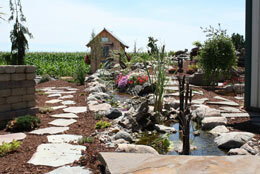 Thomas Tree and Landscape is a family owned and operated business founded by Jim and Jane Thomas in 1986. From the beginning, our hard-working staff has been dedicated to working as a team to create one-of-a kind landscapes for our valued customers. As the landscape industry has evolved over the past 30 years, we have proudly stayed on the cutting edge of new materials, installation techniques, designs, and software, allowing us to become one of the largest design/build landscape companies in the Mankato surrounding area. We specialize in using a wide variety of natural stone landscape materials to achieve the unique look you have been searching for. We take pride in our creativity, customer service and quality products. We realize that landscaping can be a large investment in a property, so perfection is always our employees' number one goal when it comes to design, installation or maintenance for your residential or commercial property. © Copyright , Thomas Tree & Landscape, Inc.